Discussion in 'Custom & Handmade Knives' started by The Virginian, Sep 27, 2012. I am not a fan of this style of knife finishing (or, perhaps, apparent unfinishing), but it seems that a lot of folks love Brut de Forge knives. Maybe it is just one of those things where you either get it or you don't. But my tastes and prefernces have changed regarding knives (and a lot of other things) over the years. Sometimes it just takes me awhile to "get it." So I thought that perhaps I am missing something regarding Brut de Forge knives. Perhaps there are aspects that I have not considered or appreciated. Do you like this style of knife? If so, why? What are the advantages? Or do you just like the way it looks (nothing wrong with that)? For a long time I don't like this style, after a customer ask me about try some on this style I started to like the way it looks, I like the way it seems old. I like them. For me it's the contrast between the rough flats and the clean blade, but then I like antique, rough knives in general. I think some do them well - and some don't. I agree that some knives it fits some it does not. I have come to really like the way Gerhard Wieland cleans the forge scale off and uses the texture to add a design feature to the knife with well blended refinment. For my taste it is entirely dependent on how it fits the overal package. I think this style looks like the maker stopped halfway through. I don't get people who don't like brut de forge but insist on sprayed/coated blades. I think it works well on users, but is no different in my mind than forced patinas. It is one of the more wear-resistant coatings out there and it's free. You can get some red rusting coming through in places, but a judicious use of rust converter sorts it without too many problems. in a collection. It's usually on scandi's where you see it done well. It's been a long time since I've made a knife that *wasn't* forge finished. Part of the reason is aesthetics and part is practicality. First off, there are well-done and poorly-done forge finishes. A forge finish shows the skill of the smith with a hammer. If you see a lot of poorly controlled hammer marks, it's not a good forge finish in my opinion. Assume for the rest of the post that I'm dealing with well-done forge finishes. I like things with a timeless quality, and a forge finish lends that quality to a blade. It doesn't scream "made in the 20th/21st century by an American maker". Depending on how you use it, it can look like some artifact from an exotic time and place, a relic of the American frontier, something forged in a post-nuclear wasteland, etc. 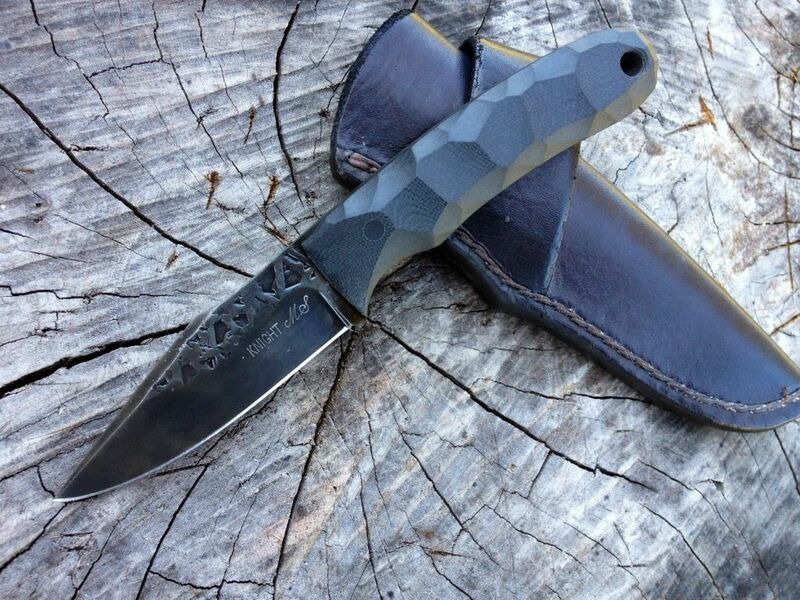 It also provides an aesthetic contrast with modern materials such as paracord handle wraps or Micarta. It goes well with a beautiful wood handle. It acknowledges the process used to shape the blade. A lot of forged blades are indistinguishable from stock removal blades. A forge finish shows that it was hammered into its form instead of hiding that. It is very easy to maintain. It's very difficult to scratch, and if it gets rusty or dirty, it can be cleaned up with 100 grit sandpaper or some Scotchbrite and look like it did when it was new. Some folks like Damascus and use it in every blade. I like forge finishes and use them on every blade. And that's ok. The Jason Knight that Joe posted is a great example of when it works well. Serge is doing some amazing work, more Relic, though. I enjoy them, if done well as Karl states, because of the skills necessary to forge such a blade and have it really stand out with the integral guard and such. I have one of Karl's and he done good! I like them a lot - on the right knife, of course. The rustic look is a nice mix for me amongst the fine satin finishes, beautiful hamons, shimmering damascus and high-contrast laminates But then, I like variety. And yes, some do them better than others. Thanks for the comments. See, I am already liking these knives better! What do you look for in a Brut de Forge? In other words, I see a few comments distinguishing between it being done well . . . and not so well. What makes the difference? Anything objective that you can point to . . . or is just the look and how it integrates with the rest of the knife? Help a brother out! Step one - distinguish between brut-de-forge and forge texturing. The former involves forging the blade very closely to shape, then grinding away only what is necessary for proper blade geometry. The latter involves final shaping with the grinder, then using texturing dies to hammer in the forge look after the fact. In either case, you want an even finish from one side of the blade to the other. Depends on the knife. Sometimes I want a brut de forge finish, occassionally I want high polish, though most of the time I prefer a working 600-grit type finish. For traditional designs the brut de forge look works. Ken, it's probably the best "they love it or hate it" element you will find in forged blades. I love it. But I've tried to build a reputation on precision and fine finishes, so most folks don't expect it from me, and don't like it when I do it. When I first got into knife making, I was in awe of the blades that Don Fogg and Jimmy Fikes had made this way... then down the road, guys like Jason Knight and Adam DesRosiers are doing it and IMHO doing it awesome. I feel very fortunate to have a customer working with me on a knife right now that's in this style. It's actually harder to do in some ways FOR ME. With my regular stuff, you can have something a hair off here or there coming off the anvil (you TRY not to, but... ) and that stuff will just get ground clean, even, and symmetrical. A brut de forge blade has to be forged right on the money, or you won't be able to get even grinds, nice symmetrical plunges, etc. I LOVE the contrast of the forged flats against the cleaned up parts of the blade. As was mentioned Gerhard is doing this SOOO WELL resulting in a beautiful contrast... that to MY EYE looks very much on purpose/part of the design, and NOT like he simply didn't finish the job. It isn't for everyone, but if we all liked the exact same things the world would be a pretty boring/sterile place. As you I did not like too much the "Brut de forge", but sometimes, knivesMaker for me changed opinion. Thank you Nick. I think this is a point that some who dismiss brut-de-forge pieces as indicating a half-a$$ed job by the maker fundamentally do not understand. But as an aesthetic feature, you're right - it does tend to fall into the love it or leave it category. When the right look is achieved, I love the way they scream, "Use me! ".